As a wellness professionals who are obsessed with balance, we always looking for new ways to encourage, inspire and help simply your healthy routine. Because the reality is, motivation is fleeting, crazy schedules get in the way of workouts, and cooking a healthy dinner after a long day is sometimes almost unbearable to even think about. But the fitness industry can sometimes take "fitspo" a little too far. And we don’t just mean with photos of girls in thongs "working out" at the dumbbell rack, those are just obnoxious, we’re talking about a much sneakier culprit lurking in your social media feed… we’re talking about the well-intended motivational meme. On the surface it seems good and well intended right? It encourages you not to compare or compete with others (something we agree with), and it focuses your attention on your journey and short term actions that you can take today. So what's not to love? The sneaky unintended message with this type of meme however, is that you should always be progressing every day, and if you aren't able to be better than yourself yesterday, you are somehow failing and should feel guilty about it. "Wow, I feel really great about this Netflix and pizza day today!" It was probably mean, and instead of enjoying your rest day and repeating the benefits of recovery, it was most likely spent feeling bad about yourself for taking it. And seeing this meme on a bad day will undoubtedly make you feel worse about not "being better". Sometimes we just need to rest and have a Netflix and pizza day (or whatever your thing is). Humans are not meant to go, go, go 24/7, and progress is not a perfectly increasing line, where each day is better than the day before. 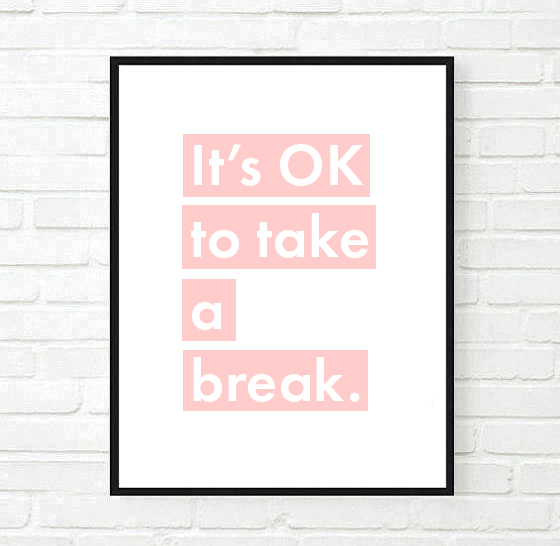 It's OK to take a break sometimes.